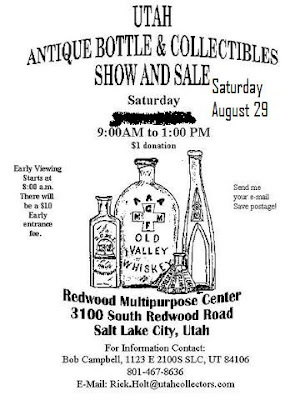 The report for the Utah Bottle Show is pretty favorable. I think the traffic count was alot higher than last year. From 9 till noon it seemed quite crowded. One nice looking Teakettle with a small repair in the base found a new home to an up and coming collector. I sold a Circle Cutter t-43 to fairly new collector. He has added 4 or 5 globs in the past 24 months. Orville P. came to the show with a box of globs to reminisce over. I haven't seen his bottles for 10 years or more, but they were all nice examples of the more often seen fifths. Seems like as a rule, better examples of the more common fifths were around 10-15 years ago. The better examples now are being locked away and replaced with lesser examples. When a nice example of a common fifth comes out now, we are shocked at the price it brings??? Sonny C. of Montana/Arizona/troutstreams anywhere, made it to the show. Good to visit with him as always. Matt Lawson made the trip up from San Diego. He and Ivan O. were planning on doing a little fishing. With a shovel? Visited with Dave B., he is waiting for his latest acquisition to arrive from American Bottle Auctions. He is putting together a super collection. Glen G. and Reid G. always have a table at the Utah show. The brothers have probably forgotten more about glob whiskies than I will ever know. Had an enjoyable time visiting with old friends, making a few new ones and I even added a few wall hangers to my bottle room.